The world’s first hybrid Amp Modelling Interface. The Audient Sono is the ultimate audio interface for guitarists and musicians, combining Audient’s award winning analogue recording technology with the world’s best speaker-cab simulation from Two notes. 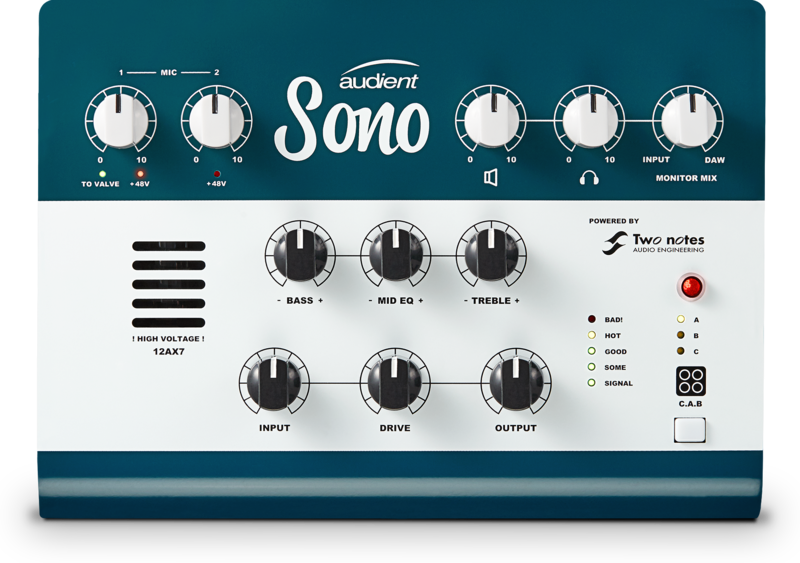 Sono provides over 20 years of analogue console design heritage on your desktop. Get studio quality recordings with two of Audient’s renowned Class - A console mic preamps. 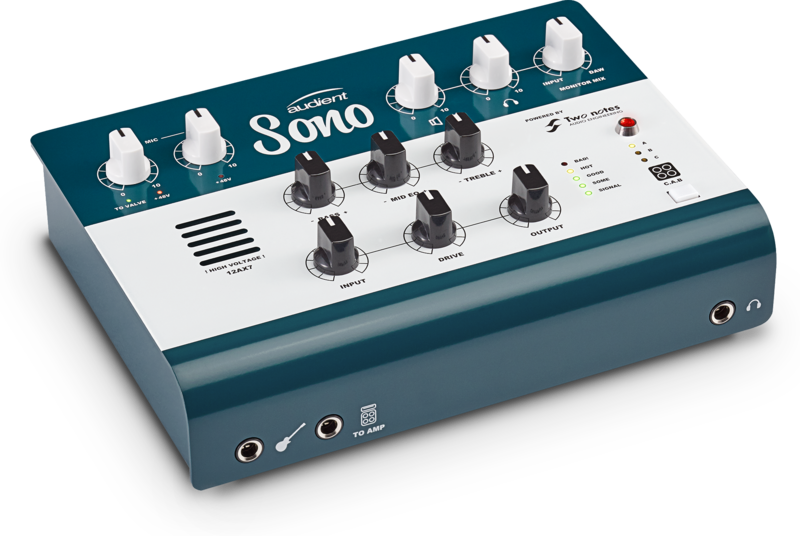 Home to ultimate D.I for guitarists, musicians and engineers alike, Sono combines an onboard 12AX7 valve and 3 band-analogue tone control with built in Two notes power amp and cab modelling. Pick and choose from a wide range of guitar and bass cabs models and play through or record classics such as the Marshall 4x12, Fender 2x12, Ampeg 8x10 and many more. Customize everything from the room type, microphone model and placement to harmonic distortion and more - all from an intuitive desktop app. Once you find a tone you love, store up to 3 presets on board. Don’t see the cab you’re looking for? Head over to Two notes online cab store to browse new cab simulations from the industry leading guitarists & studios, ideal for any genre. Plug in your favourite reverb, delay or distortion pedals and combine your unique sound with the power of Two notes and start recording your favourite tones. Route your mics or synths through the classic valve preamp, analogue EQ and Two notes processing and start creating crazy new sounds or simply add that classic analogue warmth to your recordings. 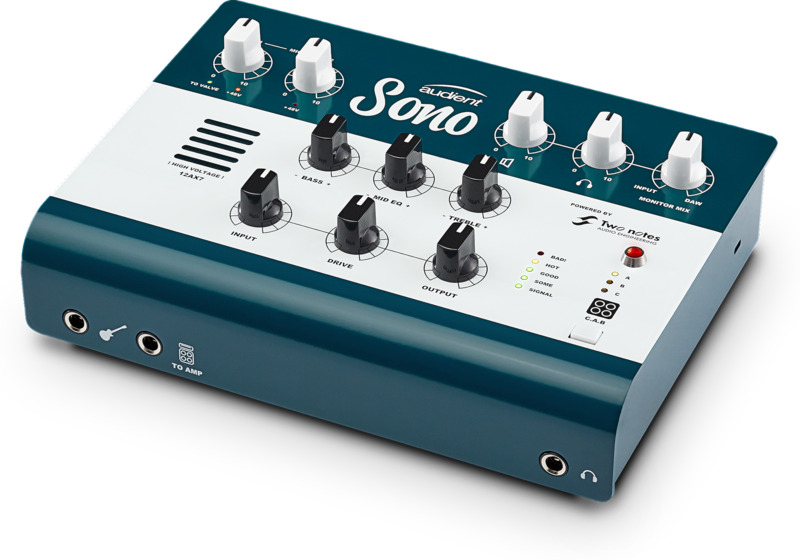 Sono always records a clean D.I signal, so you can capture your performances as creativity strikes and reamp through your favourite amps later. The re-amp output sends your signal at the correct impedance for your guitar amp, eliminating the need for a dedicated reamp box. Need to more channels? 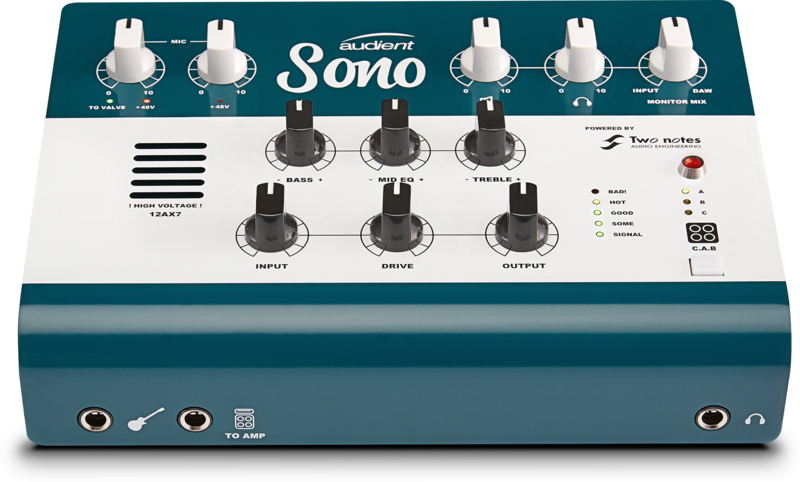 Sono can be expanded via ADAT or S/PDIF up to ten inputs via an eight-channel mic pre, such as the ASP800. Hear subtle detail, make better mix decisions and experience remarkable clarity from the moment you press play with Sono’s class leading converter technology. Hear your music as it should sound with Sono’s advanced headphone amp technology, designed to provide enough power for any headphones to perform to their highest potential. Quickly take control of complex routing set ups or low latency cue mixes for your artists, in Sono’s easy to use mixer app. Don’t let latency get in the way of your creativity. Monitor mix allows you to blend between your input signal and DAW playback, letting you record and monitor without delay. Sono comes with both a standard USB cable and a USB Type-C cable enabling you to connect to any USB compatible Mac or PC supporting USB 2.0 or above. zZounds is an authorized dealer of Audient products.